Across Arkansas, the Planners4 Health Task Force and Arkansas Coalition for Obesity Prevention (ArCOP) offered the Growing Healthy Community Regional Summit, supported by the Planners4Health grant, Blue & You Foundation for a Healthier Arkansas, and the Greater Delta Alliance for Health. During the summit trainings, participating community teams reassess the big picture of what a livable community looks like, identifying where they currently stand, and making or updating their plan to reach their vision with short-, mid-, and long-term goals. Guest speakers and facilitated networking inspired participants to learn more about who has already succeeded in Arkansas at what projects, how it was done, and how it could be done in their community. The regional summits were designed to provide Arkansans with skills to make their communities healthier and eligible projects were funded to put that training into action. Participants left with a specific vision of doable projects that helped their community fight obesity, the skills to implement these projects, and the potential for funding to get started. There were over 700 participants in attendance, supporting 105 projects and funding over $70,000. Over the past seven years, ArCOP has identified communities in Arkansas with the most significant changes towards better health are communities where the mayor is involved. Mayors who have seen the benefits of policy, system, and environmental changes first-hand have become some of our strongest champions. Mayors know healthy cities are economically secure cities. Arkansas mayors are excited to share their successes, lessons learned, and best practices with their colleagues across our state. Mayors Mentoring Mayors Infographic. 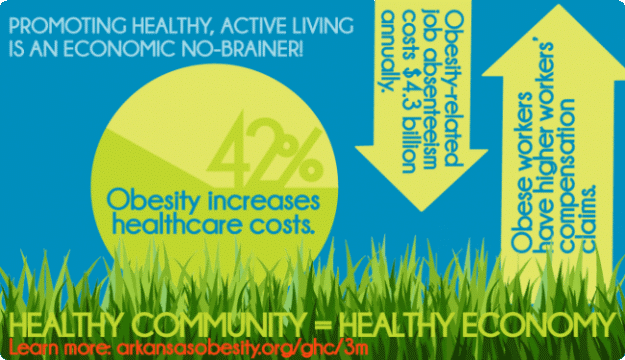 Image courtesy Arkansas Coalition for Obesity Prevention. The Mid-South Transdisciplinary Collaborative Center for Health Disparities Research (Mid-South TCC), targeted the geographic areas including Alabama, Arkansas, Kentucky, Louisiana, Mississippi, and Tennessee. In partnership with TCC, ArCOP expanded the Mayors Mentoring Mayors (3M) reach across the five additional states following the Growing Healthy Community model to implement 3M. There were 77 mayors, elected officials, organizations, and community members from six different states in attendance at the summit. Katrina Betancourt, CPM, is president of the Arkansas Coalition for Obesity Prevention.